There were 28 members present at the Avli Restaurant in Winnetka where this Rotary meeting was held. The only guest was Mason Nerheim, son of our speaker. Lee Padgett read a description of this Country’s legal system as contained in the U.S. Army’s Field Manual. Jean Wright was not present but her birthday was recognized. ANNOUNCEMENTS: Wes reminded attendees that Paul Sally, New Trier High School Superintendent, will be our speaker on January 24, 2019. Barb Tubekis reminded everyone of the Dr. Martin Luther King, Jr. “day of service” at the WCH on Monday, January 21, where there will be hands-on projects for volunteers of all ages that will help the missions of 12 participating nonprofit organizations. Also, people will be invited to share their thoughts about Dr. King and the importance of social justice. There is no admission fee but donations will be accepted of laundry detergent, umbrellas and warm coats for Vets and refugees. 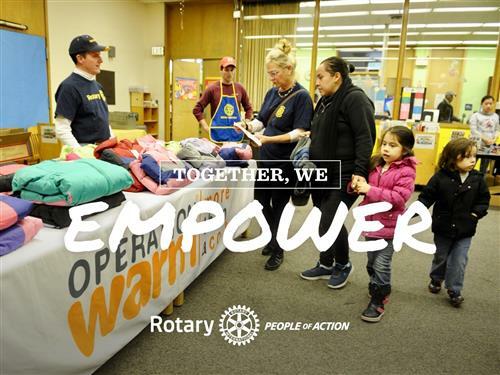 Barb mentioned that New Trier’s Rotary Interact Club will be participating and about 500 people are expected to attend. Barb also mentioned that we received a “thank you letter” from Youth Services for the meals several of our Rotarians packed for the recent holidays—she read a thank you letter from a young child, Amy, who thanked the volunteers and said that Santa could always sleep on her couch if he needed rest. David Birkenstein reminded everyone that effective 1/27/2019 the price of a postage stamp increases from 50 to 55 cents. 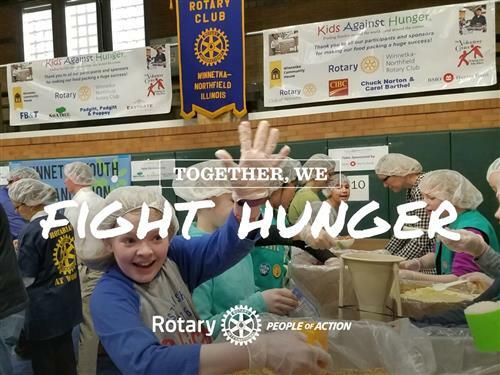 Rich Lalley mentioned that all members will be receiving an email from our District rep Kevin Stevens asking all members to fill out a survey about their Rotary experiences—it’s important that we all take the time to complete this survey. HAPPY BUCKS: Robert Mardirossian donated for President Leske’s repeated reminders that this meeting was going to be at Avli so members wouldn’t show up at the WCH. Dig and grin: Brooke Peppey's suggestion that she not do it in the future was voted down unanimously by the attendees. SPEAKER: Michael G. Nerheim, Lake County State’s Attorney: Mike is Lake County’s version of Kim Fox in Cook County. Cook County has 800 lawyers in its office, whereas Lake County has 142 total personnel and 3 service dogs. Mike has had extensive experience working in all criminal divisions of the Lake County State’s Attorney’s Office and has received several awards for his efforts to reduce recidivism and juvenile crime, his leadership in prosecuting gang crime, his support of sexual assault victims, his leadership in making the public aware of the opioid overdose crisis, and as one of the 4 co-founders of the Lake County Opioid Initiative. This Initiative was started 6 years ago to make the public aware of this crisis and to take action to combat it. There are now 300 active participants in this initiative, including representatives of government, law enforcement, faith based groups and medical providers. The primary effort is to reduce the demand and use of such drugs as heroin, vicodin, cocaine, methamphetamines and oxycontin. One of the major causes of this problem is the over prescribing of these drugs by the medical and pharma industries, plus the careless disposal of unused prescriptions by the intended users. Lake county now has 37 drop off boxes where unused prescriptions can be deposited—last year such boxes collected around 13,000 pounds of unused drug. Lake County has established the “text to tip” program which encourages people with drug problems or who know of people with such problems to report such activity on a confidential basis so that the victims can seek medical assistance for the problem. Last year there were approximately 15,000 texts identifying drug problems. Communities and law enforcement are now trying to get many of these victims into mental health treatment as opposed to prisons. The drug abusers used to have to be arrested before they could get into these programs—now many counties have “A Way Out” program where treatment is available without the need for arrest. The legal system is working on expunging many felony convictions for drug use so that a youngster’s life is not tainted forever by a mistake made early in life. Unfortunately, access to heroin and related drugs is easier now than ever and the costs of such illegal drugs continue to be cheaper. 9% of all heroin used in the U.S. comes in from Mexico and most of the major highways tend to run through Chicago, thus the Chicago area is a huge market for the suppliers. This Country has 5% of the world’s population but uses 80% of its pain killing drugs. Mike said that border security can’t keep out all the drugs because the drug cartels have had time to develop their transportation systems using planes, boats, tunnels--- even some old submarines are being used. All major police departments have antidote training to treat heroin overdoses, but the problem is that the withdrawal from such overdose is so severe that there is a high percentage of these victims repeating the usage and withdrawal experiences. Thus, the emphasis is now on trying to reduce the demand for potential drug users; trying to enforce stricter laws against the drug dealers; trying to get the pharma industry and medical personnel to be more accurate and informative about the likelihood of and seriousness of addiction; trying to get mental treatment to victims rather than incarceration; trying to improve reporting and purchasing policies so that users cannot go to several different types of doctors to get excessive and unlawful amounts of prescribed drugs; and encouraging people to use drop off boxes for unused drugs versus leaving them in their medicine cabinets or flushing them down the toilet (the Winnetka Fire Department and most CVS drug stores now have drug drop off boxes). When asked in the Q & A period about whether this problem would be solved by legalizing drugs like marijuana, Mike said that states considering such laws, like Illinois, need to review carefully the experience of other states that have legalized drugs before they join in this movement. He gave as an example of a serious legalization problem the difficulty of law enforcement or employers proving that a person is under the influence of marijuana because there is no reliable sobriety test for being under the influence of “pot”. The blood tests can easily be positive for several weeks after usage of same. In Illinois, an individual has to consent to a blood or urine test and law enforcement has a tough time convicting someone solely on one of the old sobriety tests of asking drivers to walk a straight line, recite the alphabet backwards, stand on one leg, etc.